At the invitation of Minister Louise Mushikiwabo of Foreign Affairs, Cooperation and East African Community of the Republic of Rwanda, Minister Manuel Domingos Augusto of External Relations of the Republic of Angola, Minister Noel Nelson Messone of Foreign Affairs, Cooperation, Francophone, Regional Integration and Overseas Compatriots of the Gabonese Republic, Minister Urbino Botelho of Foreign Affairs and Overseas Compatriots of the Democratic Republic of São Tomé and Príncipe, Foreign Minister Wang Yi will pay official visits to the aforementioned four countries from January 12 to 16. Q: The high-level talks between the DPRK and the ROK are being held in Panmunjeom. The head of the ROK delegation said that a good start is half way to success. It is reported that the ROK proposed a joint parade with the DPRK at the opening ceremony of the Pyeongchang Winter Olympic Games. What is your comment? A: This morning the DPRK and the ROK held high-level talks, receiving much attention from the international community. 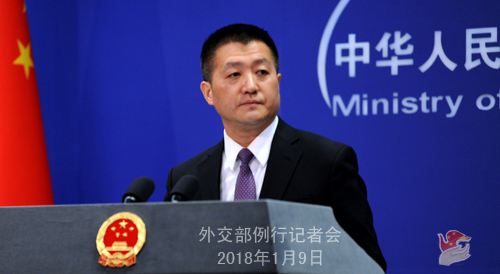 It is natural that China, which pays great attention to the peace, security and stability of the Korean Peninsula and the region, also follows the talks closely. We have seen relevant reports, and we are pleased to see the high-level talks happen between the DPRK and the ROK. As we said many times, as a close neighbor of the Korean Peninsula, China welcomes and supports the positive steps recently taken by the DPRK and ROK to ameliorate their relations. We hope that the talks will mark a good beginning in improving relations, pushing forward reconciliation and cooperation between the DPRK and ROK, and easing tensions on the Peninsula. We also hope that the international community can root for both sides and give them full understanding and support. Q: The Philippines' Defense Minister has said that the Philippine side is going to lodge a diplomatic protest to China over the buildup of the Yongshu Reef in the South China Sea, saying that China has reneged on its promise that it will not militarize the island. What is your response? A: China's peaceful construction on its own territory aims to make greater contributions to regional peace, navigation safety, disaster prevention and relief, maritime search and rescue and marine scientific research. Certainly, China also needs to construct necessary defense facilities for its own territory, which are not directed at any country. As friendly close neighbors, China and the Philippines maintain unimpeded dialogue and communication on maritime-related issues. The Chinese side stands ready to continue stepping up communication with the Philippine side so as to eliminate misunderstanding and enhance mutual trust. Q: For over 20 years, the Foreign Minister of China has been choosing Africa as the destination for his first trip abroad each year. 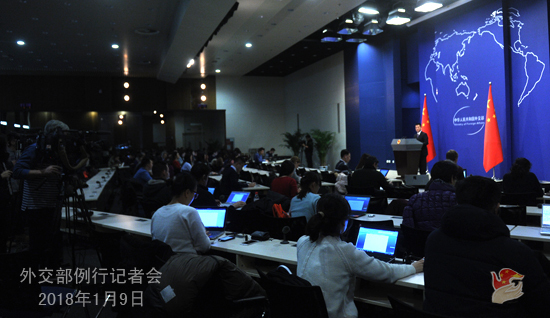 What is the main goal of Foreign Minister Wang Yi's visit this year? A: To strengthen solidarity and cooperation with African countries is an important cornerstone of China's foreign policies. For more than 20 years, the Chinese foreign ministers have all chosen Africa for their first overseas visits each year. Foreign Minister Wang Yi's upcoming Africa visit is a continuation of this fine tradition, which speaks volumes about the high priority China consistently attaches to China-Africa relations. The year 2017 has witnessed the concept of China-Africa win-win cooperation and common development winning greater popularity, with the China-Africa Comprehensive Strategic and Cooperative Partnership registering sound and smooth growth, the outcomes of the Johannesburg Summit of the Forum on China-Africa Cooperation being implemented in a comprehensive way, and the Belt and Road Initiative achieving early harvests in Africa. The year 2018 is important for China and Africa to build on the past achievements and usher in a brighter future. To build on the past achievements, China and Africa will enhance alignment to see that the promises of the Johannesburg Summit of the Forum on China-Africa Cooperation are successfully and fully delivered. To usher in a brighter future, since China and Africa have agreed to upgrade this year's Forum on China-Africa Cooperation to be held in China to a leaders' summit, the two sides will follow the spirit of shared benefits through consultation and contribution and make the summit another historic event where China-Africa solidarity and cooperation can be strengthened. Foreign Minister Wang Yi's Africa visit will uphold the basic principles of China's diplomacy in the new era and the policies and guidelines on China's relations with Africa featuring sincerity, real results, affinity and good faith, strengthen communication and alignment with the African countries, and step up efforts to implement the important consensus reached by President Xi Jinping and African leaders, cement mutual political trust and expand pragmatic cooperation so as to lay a solid groundwork for the Summit of the Forum on China-Africa Cooperation to be held in China this year. Q: Do you have any updates on the ship collision accident occurred off the coast of the East China Sea over the last weekend? A: The Chinese side attaches great importance to this maritime disaster. Yesterday, I said that the Chinese government is taking positive measures to carry out search and rescue work. According to the information we have received from the competent authorities, there are now twelve vessels assisting in the search and rescue efforts in the waters where the accident happened. Meanwhile, the Chinese side is actively engaged in maritime cleansing work. Yesterday, some of you asked about the cause of the accident. I would like to say that the investigation is still underway. If we have further information, we will keep you updated. Q: In response to a media report that China is planning to build a military base in Pakistan, a senior Pakistani official said that the Chinese government has neither made such demand, nor did both governments discuss such a plan. What is your comment? Q: President Macron said in Beijing that the Belt and Road Initiative proposed by President Xi Jinping is very important, and it represents a real opportunity to create bridges, through exchanges, between countries and civilizations, just as the ancient silk routes once did. It will also promote Eurasian connectivity. France would like to take an active part in it. What is your comment? A: We have taken note of these remarks by President Macron. We welcome France and other European countries playing a positive role in the advancing of the Belt and Road Initiative. The Belt and Road Initiative is an important public good provided by China to better promote global development. It also offers a broader platform and enormous opportunities for international development and cooperation. Five years after its inception, the Belt and Road Initiative has been well received by a growing number of countries and international organizations, with its early harvests already delivering tangible benefits to local people along the routes. France's participation in the Initiative will help expand the space for its own development and international cooperation, promote China-France practical cooperation, and achieve a higher level of win-win results for both countries. China stands ready to work with all parties including France to follow the principle of extensive consultation, joint contribution and shared benefits and steadily advance the Belt and Road Initiative so as to create more opportunities for the development of countries around the world and the global economic growth and usher in a brighter prospect for different civilizations to flourish altogether. Q: As you mentioned yesterday, China's Commerce Ministry in September issued a notice that DPRK-owned businesses in China would need to cease operation. Could you confirm that today is the final day for them to stop their operations and what penalties will befall if these companies fail to stop? A: Yesterday, I said that in the notice put up by China's Commerce Ministry and the State Administration for Industry and Commerce on September 28, 2017, clear-cut stipulations are made on the implementation date. If you read this notice, you can learn about the time frame. I also said that as a permanent member of the UN Security Council, China always strictly implements the relevant resolutions adopted by the UN Security Council. Q: Yesterday, the Indian army chief said there has been a major reduction of Chinese troops in Dong Lang. Can you confirm this and what is your comment? A: The Dong Lang area has all along been part of China and under China's continuous and effective jurisdiction. There is no dispute in this regard. 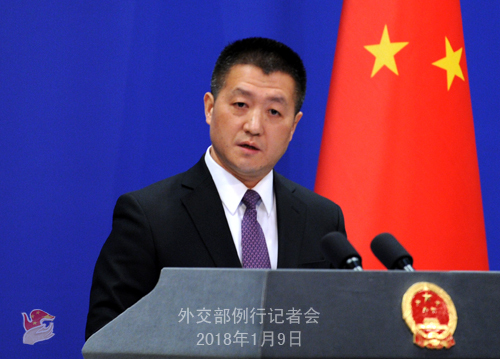 The Chinese border troops' patrolling and stationing in the Dong Lang area is exercising sovereignty rights in accordance with the stipulations of historical conventions and upholding territorial sovereignty.